The new Spacegazer.com website went live on 19th January and exceeded 1000 hits in its first two weeks on-line. Colin Donaldson, one of our junior members, attended Space School in Houston, Texas, in January. Last summer, he completed six modules on space science to become one of only 50 students across Scotland to achieve the high marks required to be accepted. During the week long course at the Johnson Space Centre, he met various Astronauts, toured mock-ups of the Shuttle and International Space Station, listened to a number of lectures, took part in building rovers to navigate martian-like terrain, and assembled and launched rockets. 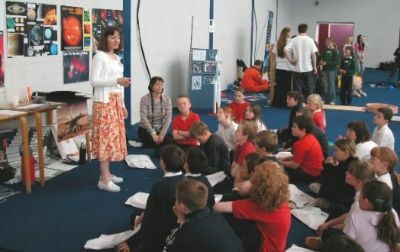 The first Science Festival for children was held on the 14th June at Ross County indoor football stadium. As part of the Earth and Space zone, Andy Ferguson and I gave a number of 45 minute presentations to the primary school children involved. These were aimed at trying to help the children understand the vastness of the objects in space. Our supernova explosion (a party popper) ensured both the children and presenters remained alert. In the Space Flight section Colin Donaldson, in his orange NASA jumpsuit, was one of the Scottish Space Foundation pupils demonstrating meteor impacts. We hosted the Scottish Astronomers Group Weekend at the Thistle Hotel in September. 34 people from all over Scotland attended this event to listen to a number of varied and interesting talks, three of which were given by HAS members. Solar viewing had been arranged up at the observatory but unfortunately it was cloudy. Pat Williams did a tremendous job organising the event and has been praised by the SAG Committee. We were partially successful in observing a partial eclipse of the Sun on the 3rd October inviting passing members of the public to view the event with us. Going Nova made its debut in November at which both HAS and SIGMA played a large part on the Friday (12 schools attended) and Saturday (public day). Maarten de Vries was part of the newly formed company who organised the event. Numerous activities had been arranged as well as a number of sessions with the Faulkes Telescope - a remote telescope in Hawaii, which we controlled via a computer in Horizon Scotland, Forres. Bill Leslie from SIGMA led a team consisting of Alan Tough, also from SIGMA, Rob Nuttall, Eric Walker and myself from HAS, and Matt Hollister from the Royal Observatory,Edinburgh. The images we took with the Faulkes Telescope can be seen on out Gallery or on Bill's website. Specialist speakers had been arranged for Thursday and friday evenings, and talks by Matt Hollister as well as members from both Societies, took place on the Saturday. All members who helped at the event did a superb job and contributed to its sucess. Giving talks to different organisations, including schools, was becoming a regular occurrance. Numerous setbacks along with a great deal of time and effort has been put into designing the new observatory this year. Progress is slow but is moving forward.